Signs of a leaking water pump. Has your vehicle been overheating lately? When you look under your parked car or truck, do you see a small puddle of water or coolant near the front? If so, then it's likely you need to work on your water pump. After inspecting your pump for leaks, it would be good news if you simply had a leaking coolant hose. Those are easy to spot, since you will see some dry crusty coolant build up near the outlet pipe where the hose meets the water pump. But if not, then get ready to get greasy. Whether it's a leaking gasket or hub bearing, the water pump cannot do its job if it is not completely water tight. Leaking coolant and water from your engine will result in gradual increases in operating temperatures. At first it's no big deal, but coolant loss is an exponential problem. The longer you drive on a malfunctioning or leaking water pump, the more danger you are in of causing irreversible damage to your engine block and internals. When did water pumps come along? Internal combustion engines were not always water-cooled. In fact, the first half-century of automotive history exclusively featured air-cooled engines that did not have water pumps. This was adequate for the slow pace and short distance travels of the first automobiles. But necessity is the mother of invention, and WWII required vehicles that could be driven long and driven hard. This prompted the creation and ubiquitous proliferation of the water-cooled engine. The principal character of the water-cooled engine is the water pump. It is connected directly to the crank shaft by a belt and pulley, so it rotates at the same rate as the engine. Along with the radiator, thermostat, and a system of hoses and cooling pipes, the water pump continuously recirculates a mixture of water and coolant through the engine keeping operating temperatures down below the boiling point. Installing a water pump is often times a difficult task, and can sometimes take an entire day to get the job done right. But as long as you have the right tools and follow the procedures specific to your vehicle, you should be okay doing this yourself. First, your engine should be completely cool. This could take a few hours, but it makes the job of replacing your water pump much easier. Once your engine is cool, you can remove all the belts that connect the water pump and accessories and begin to drain the coolant from the system. Start by pulling the drain plug on the radiator, and once the coolant has stopped flowing you should rotate your water pump pulley to get the last remaining bit of coolant out. At this point, you can now disconnect the cooling hoses from the water pump. Next, unbolt the water pump from the engine block (or oil pump, timing cover, or whatever it is attached to). You should remove ALL left over bits of the old water pump gasket at this time too. Now line up the gasket, bolt holes, and install the pump. Finally, reconnect all the other components you have removed in reverse order. Refill your radiator with coolant and start your engine. The new coolant will cycle through the engine, and you will want to top it off little by little until you are full. The best parts you will ever need are right here. At Car Parts Discount, we know that there are many options when buying water pumps online. If your car is out of commission, the last thing you want to do is spend more time and money than you have to when trying to find a replacement. 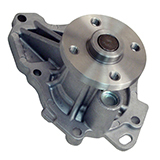 Whether you are looking for a new water pump, gasket, or pulley, we have options for any budget. You can choose from top quality reproductions, original equipment, or inexpensive replacements all in stock and ready to ship right away. Don't put off fixing your water pump any longer.